I am grateful to the Kutsche Office of Local History for this award. I also would like to thank friends and family who continue to support the efforts and energy I put towards the Grand Rapids People’s History Project. However, what I would really like to say is that what is most important about this award is that it is not only a recognition, but an elevation, indeed an affirmation of the people who have been part of the social movements throughout the history of Grand Rapids. For me this award gives voice to the thousands of people who have resisted, fought, struggled and took risks against injustice and systems of oppression. Indigenous people who resisted and continue to resist Settler Colonialism; working class people who truly built this community and have resisted the capitalist class that practices a politics of disposability when it comes to workers; African Americans who have fought against White Supremacy In Grand Rapids or as Todd Robinson insightfully names it, Managerial Racism; the women’s suffrage movement in Grand Rapids; the various iterations of the feminist movement that would not accept the repressive forms of patriarchy and spiritual violence that have sought to silence them; the South African Anti-Apartheid Movement, which got the City of Grand Rapids to divest from South African in the early 1980s; the Lesbian, gay, bisexual, transgender and queer movement which got the city of Grand Rapids to include sexual orientation in its anti-discrimination ordinance in 1994, making this community the 10th city in the country to pass such an ordinance; the Central American Solidarity Movement, that not only educated thousands locally on the brutal US policies of the 1980s, but saw over 100 people from Grand Rapids actually go to countries like El Salvador, Guatemala and Nicaragua to stand in solidarity against its own countries policies; the Anti-Vietnam War Movement, the Independent media movement, the Immigrant Rights Movement, the Disability Rights Movement, the Animal Rights Movement and so many other movements that have come before us in Grand Rapids, movements that have risked so much, movements that have given us so much. It is for these people and these movements that I accept this award. These people and these movements are generally not the kind of history we are taught. Indeed, these people and these movements are not recognized in the same way as those with power, both economic and political power, like the people who have their names on the buildings around this campus and throughout Grand Rapids. And this is exactly the reason why I do this work and why we need to shine the light on the rich history of social movements in Grand Rapids. 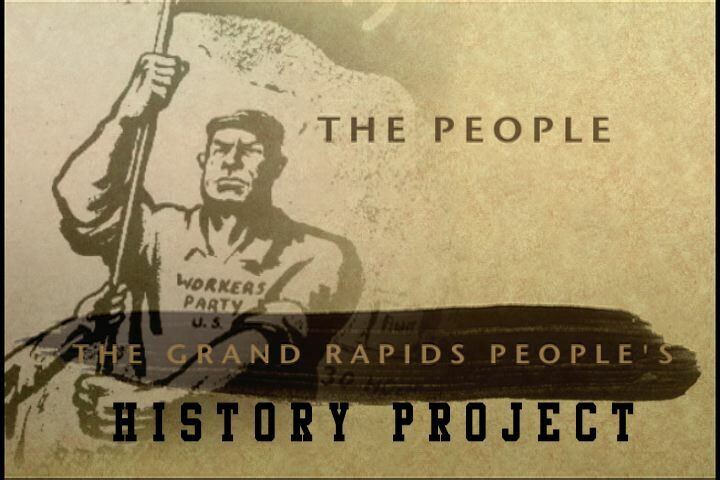 What the Grand Rapids People’s History Project tries to do is invoke stories as a form of public memory. To not do so what be to give into the violence of organized forgetting. This entry was posted in Uncategorized and tagged GR People's History Project, social movements in Grand Rapids. Bookmark the permalink.